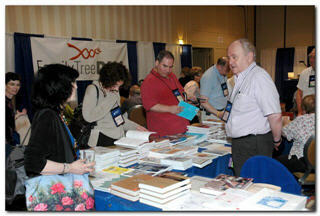 The 29th IAJGS International Conference on Jewish Genealogy, co-hosted by the IAJGS and the JGS of Greater Philadelphia, from August 2-7, 2009, drew 948 attendees who enjoyed wonderful programming, SIG luncheons, tours, workshops, valuable networking and much more, making this conference the largest since the New York conference in 2006. Of the attendees, 378 indicated they were “first-timers,” a number we believe may be a record breaker. The conference opened with an incredibly emotional presentation by Father Patrick DeBois on his work to uncover the truth behind the murder of 1.5 million Jews in Eastern Europe and ended with stand-up comedian Yisrael Campbell at the banquet. In between there were too many other memorable programs and activities to list. A little over 100 people enjoyed wonderful tours in and around the Philadelphia area. Almost 250 tickets for the Breakfasts with Experts, 511 tickets for SIG Luncheons and 290 tickets for Computer Workshops, 75 tickets for the welcome dinner and 300 for the banquet were purchased. European experts shared their knowledge and advice to the benefit of many attendees. 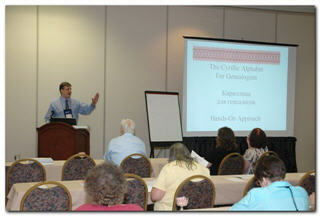 Many other speakers provided tips, insight, and help for enhancing research. 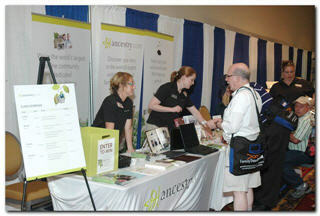 A number of sessions focusing on the historical setting in which our ancestors lived were well received. For the fourth time, the film festival was a success. A genealogy game-night was held for the first time. As always, attendees “complained” about having to make too many choices among the many programs. We wish to thank the many contributors to the conference: Roberts Charitable Foundation – Stanley Merves, Trustee; The Generations Network, Inc, Ancestry.com; Genzyme Corporation; E. Randol and Pamela Schoenberg; Albert Einstein Healthcare Network, Victor Center for Jewish Genetic Diseases; Center for Jewish History – Ackman & Ziff Family Genealogy Institute (NYC); Goldsteins’ Rosenberg’s Raphael-Sacks Inc.; Harvey M. Krueger; JGS, Inc. (New York): Lucille Gudis Memorial Fund; Joseph Levine & Sons, Inc.; Judy & Mickey Langsfeld – In memory of Rabbi Rabbi Malcolm Stern; The Miriam Weiner Routes to Roots Foundation, Inc.; The National Museum of American Jewish History; Ronald Rubin; B&R Services; Fred Blum; Hangley Aronchick Segal & Pudlin; Stephen & Suzanne Jacobs; The Jewish Exponent-Jewish News for the Philadelphia Area; Jewish Genealogical Society of Greater Philadelphia: Monica Leonards Memorial Fund; Karr Barth Associates; Levin Family Foundation – Lawrence D. Levin, Trustee – in memory of Albert & Miriam Levin and Sam & Ethel Lipschutz; David and Judi Mink; Performance Arts Foundation – Dan Rottenberg, Trustee; David H. Wice; a number of SIGS; and 90 additional individuals most of whom are members of the JGSGP. There is no way to adequately thank the many individuals who helped make this conference a tremendous success. This was the second time that the IAJGS has co-hosted a conference – demonstrating that this is a viable means of making sure that there is a conference every year. 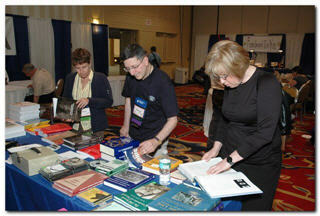 The co-chairs of the conference were Anne Feder Lee (IAJGS) and David Mink (JGSGP).